The ESR test measures the ESR blood level. This ESR blood test is also known as a erythrocyte sedimentation rate test. The ESR test measures the ESR blood level. Why is an ESR test important? The ESR blood test helps evaluate inflammation in the body. This ESR Test is a blood test. The ESR test, also known as an erythrocyte sedimentation rate test, ESR blood test, ESR lab test and sedimentation rate by modified westergren blood test, checks the ESR blood level. The ESR test is a test that analyzes how red blood cells (RBC) form a sediment over a sixty minute period. 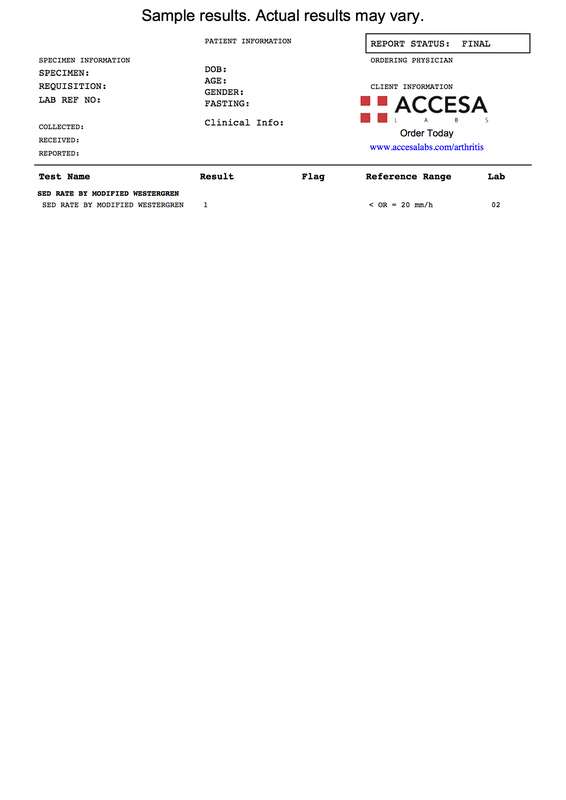 This ESR blood test is used as a general measure of overall inflammation. During inflammatory processes, RBCs will stick to one another more readily and form dense stacks which from sediment more quickly. Various clinical states of generalized inflammation will increase the ESR blood level. Some of these states, like pregnancy, are not related to an underlying illness. Other conditions like autoimmune disorders, cancers, and blood disorders will result in an elevated ESR. The ESR is still routinely helpful in diagnosing Kawasaki's disease and temporal arteritis. Additionally, ongoing measurement of blood ESR levels might be helpful in tracking the progress of inflammatory states in the body. As a marker for inflammation, it is often ordered with the CRP test. To get an ESR blood test near you, order online and get your blood drawn at the Quest Diagnostics lab you chose. Once your ESR lab report is ready, it will be available for download. As can be seen on the sample ESR lab results above, the ESR blood level (sed rate by modified westergren) will be reported as a number and can be compared against the reference range provided by the lab. The ESR lab test is a component of the more detailed joint pain test panel. ESR Test at Guaranteed Prices.